MARIETTA, GA (April 21, 2016) — Marietta based ETA – Creative Event Producers, was named as one of the fastest growing companies in Atlanta during the 2016 Atlanta Business Chronicle’s Pacesetter Awards. 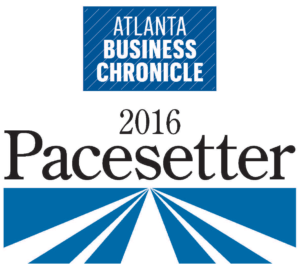 The Atlanta Business Chronicle (ABC) Pacesetter list recognizes the 100 fastest growing private companies in metro Atlanta. Recipients were announced on April 21st during the Atlanta Pacesetter Awards Ceremony at Georgia Aquarium. ETA’s Core 4 values has helped drive the culture, vision and success of the company since day one: 1. Do the right thing 2. Show people you care 3. Always give 100% 4. Be better. Founded in 2011, Marietta based ETA – Creative Event Producers is one of the fastest growing event production companies in the country, producing more than 100 live events a year. Core services include event management, A/V production, video services, creative brand support and entertainment. We pride ourselves on creating memorable experiences for our customers, which ultimately engage and entertain their audiences. The ETA team brings well over 150 years of event production and marketing activation experience to each project as we continue to honor our four core principles; Do the right thing, Always give 100%, Show people you care, and Be Better.